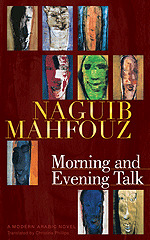 Morning and Evening Talk "Hard Cover"
A late work by the Egyptian Nobel literature laureate, Morning and Evening Talk is an epic tale of Egyptian life over five generations. Set in Cairo, it traces the fortunes of three families from the arrival of Napoleon at the end of the eighteenth century to the 1980s, using short character sketches arranged in alphabetical order. This highly experimental device produces a kind of biographical dictionary, whose individual entries come together to paint a vivid portrait of life in Cairo from a range of different perspectives. The characters include representatives of every class and human type, and as the intricate family saga unfolds, a powerful picture of a society in transition—and the accompanying upheaval—emerges. This is a tale of change and continuity, of the death of a traditional way of life, of the road to independence and beyond, seen through the eyes of Egypt’s citizens. Naguib Mahfouz’s last chronicle of Cairo is an elegy to a bygone era and a tribute to the Egyptian spirit. It is also one of his most technically innovative contributions to the Arabic novel.